Left: The Lost in Love Asia cover. Middle: The Lost in Love North American cover. Right: The Lost in Love European cover. Above: The Lost in Love album went platinum in 1980. Mention the name Clive Davis to anyone who has been in music since the '60s and they would acknowledge that he is one of the most influential people in the history of recorded music. From Jimi Hendrix and Janis Joplin to Air Supply, Whitney Houston and country star Alan Jackson, Clive has always been fully involved in his artists' careers. 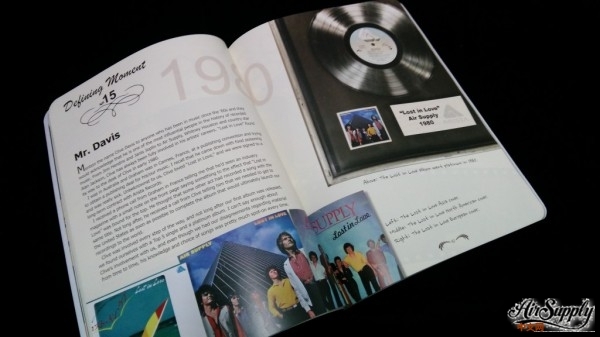 "Lost in Love" found its way to the desk of Clive in early 1980. I was in Australia and Graham was in Cannes, France, at a publishing convention and trying to obtain a publishing deal for his/our music. I recall that he came down with food poisoning and was really sick. Unbeknownst to us, Clive loved "Lost in Love," and we were signed to a long-term contract with Arista Records. I received a phone call from Graham in France telling me that he'd seen an industry magazine with a small note on the front page saying something to the effect that "Lost in Love" was bound for the top. He thought that some other act had recorded a song with the same title. Not long after, he received a call from Clive telling him that we needed to get to the United States as soon as possible to complete the album that would untimately launch our recordings to the world. Clive was involved every step of the way, and not long after our first album was released, we found ourselves with a Top 5 single and a platinum album. I can't say enough about Clive's involvement with us, and even thought we had our disagreements regarding material from time to time, his knowledge and choice of songs was pretty much spot-on every time.